this morning – for the last time ever this week – i woke up, dragged drug hauled myself out of bed, roused three kids – one of them a teenager who isn’t keen on rousing – got us all out the door and to the school plenty early for any and all last minute setups required for today’s holiday bible club craft. holiday bible club is the same thing as vacation bible school – i’m not sure exactly why the difference in names, but replacing the word school with the word club certainly makes it sound more fun. a12 and s9 attended – it’s a12’s last year. next year she can be signed up by her mom to willingly volunteer. c15 would tell her that it’s the best! since the kids were all involved i figured i might as well be, too. and since someone asked if i would head up crafts i figured i might as well say, “yes” and i smiled when i said it. that yes could have also been caused by the fact that i have difficulties saying no. even when i’m thinking “no” the word that come out is “yes”. it doesn’t always work out so well for me. the church we’re at creates their own holiday bible club from the ground up. no box kit for them. a theme is decided on, someone writes a script, actors are procured and rehearsals happen, songs are dug up that fit the theme and interest the kids, a games director comes up with games that can be played inside and out – since it is rainy season, shirts are designed and made, snacks are provided and, of course, crafts are essential. this year the theme was rock’n’roll roller coaster. it was about the life of peter and his many ups and downs. throughout the week tons of material was covered from Jesus calling the disciples through the crucifixion and resurrection. and my job was to develop 5 crafts for 150 kids ranging in age from 5 – 12 (oh, with the last minute addition of 3 & 4 year olds) each day that would reinforce what they’d learned, entertain them, and keep them busy for 12 hours 45 minutes. 45 minutes is an eternity when it comes to occupying kids with string, beads, paint, paper and glue. here’s a basic run down of what we did – because i am sort of impressed with how well everything turned out i feel the need to share. monday – Jesus called the disciples to be fisher of men. our craft was creating fishing nets from netting, yarn and beads. the toothpick idea i mentioned here worked well. there were a few minor issues, but it turned out okay. tuesday – Jesus helped peter walk on water. we painted hand towels. we marble painted the water onto the bottom half of the towel and then stencilled on fish and a boat. wednesday – peter denied Jesus. Jesus was crucified and resurrected. pick up your cross and follow me. we made seed bead safety pin pins. this one i was worried about. thursday – peter became the rock. which required rocks to be painted. friday – peter reminisces about his life. we made scrolls using saa paper. the kids discussed the week in their groups and then drew pictures or wrote about the week and what they remembered best. i was very happy that i heard no complaining about the crafts. no “do i have to do this?” or “this is stupid” type comments. and i was quite glad to not come across any abandoned crafts as i was leaving each day. and everyday i came home and practiced saying, “no, i do not want to do that.” i swear i’ll remember if they ask again next year. i would love to have had some pictures to share, but our camera is in uganda with michael. lucky camera. It’s a food post. With pictures. I got myself invited to a cookie exchange. And then I panicked. I needed a good recipe. Something interesting. Just off the beaten path enough to not be the same cookie everyone else was bringing and at the same time it needed to be just the right amount of unimpressive to make it not look like i was trying too hard. I ruled out anything with icing right off the bat. I know my limitations and baking 96 cookies in a toaster oven is enough of a challenge without having to worry about icing them perfectly. And, because this is Thailand, there were many recipes that could be crossed off the list because the ingredients are unavailable or way, way too expensive. I ended up going with Big Soft Ginger Cookies. It helped that someone had just given me a few cups of tar molasses. And, since I know you have no desire to click on over to the recipe, I’m going to go ahead and post it. With pictures. Sift together the flour, ginger, baking soda, cinnamon, cloves, and salt. No need to worry if you live in a country where you’ve been unable to find a sifter thing. They come out great without the sifting. In a large bowl, cream together the margarine and 1 cup sugar until light and fluffy. then stir in the water and molasses. I know, it looks a whole heck of a lot like tar. But it smelled a whole heck of a lot like molasses. Yuck. I hate the smell of molasses. Gradually, stir the sifted ingredients into the molasses mixture. The recipe says to stir, but I’m pretty sure it meant to blend or mix or whatever the proper instruction is when using a mixer. I also made that same assumption in the above step with the smelly molasses. DO NOT CONTINUE. If you follow the directions you will have a huge mess and miss out on the secret they don’t tell you. Trust me – this secret is a secret worth knowing. Cover the bowl and stick in the refrigerator for about an hour. It helps immensely. While the dough is chilling you should chill, too. Shhhh…. that’s the secret. It is the only thing that will get you through baking 12 batches of cookies in your toaster oven. Pour yourself two one of these. That would be vodka and cranberry juice. Start with mixing it 1/2 and 1/2. Adjust to meet your fancy. before removing to a wire rack to cool completely. Depending on how much of the secret ingredient you used you might need to arrange for some cookie guards. Mine are raw silk Santas. Working hard to protect me from the cookies. They did a fantastic job and will be moving on to serve as teacher gifts. They are very talented. If you’ve made it all the way to the bottom of this post I’m sure you’ll be tickled pink to know that I had the only Big Soft Ginger C0okies at the exchange. are there language lessons for that? recently, it’s been brought to my attention that animals speak in different tongues. and i had no idea that one country’s animal onomatopoeia isn’t the same as another. for example, an american pig goes “oink, oink” while a japanese pig goes, “boo boo”. this discovery was made when a thai friend was talking to me about a rooster and it’s incessant “ake-e-ake-ake”-ing. rooster in thai is gài dtua pôo. and i didn’t know that. so when she was telling me the gài dtua pôo woke her up going “ake-e-ake-ake” i assumed she was talking about a charlie horse in her leg aching and waking her up. and what a good laugh she we had once we figured out how silly i am. i immediately came home to google this and see what was up. sure enough, roosters around the globe speak many languages. and because i would hate to think i could have stopped you from the same embarrassing situation, i’m sharing my new found knowledge. one day, you’ll thank me. plus, i found this way cool website where you can hear different animal sounds. but i’m not 100% sure of the accuracy. i don’t agree with all the sounds they say the animals that are american make. this morning i made the most incredible chocolate chip cookies – evah. i love to bake, but have been hesitant because the closest thing i have to an oven is a toaster/convection oven. the owner’s manual is completely in thai. so i just sort of guess how to use it. but i’ve mastered toast and feel ready for bigger challanges. like the most incredible chocolate chip cookies – evah (miccc-e). and because i have nothing but time on my hands i thought i would share. the recipe and how to, not the cookies. it starts at the grocery store. where i found this. which triggered the miccc – e recipe memory. which meant i had to hunt for the rest of the ingredients. luckily, i’ve memorized the ingredient list for this recipe. which is great progress. i remembered that i had flour, brown sugar, salt, eggs, vanilla and milk at home. so only one thing is left. and i spend forever hunting it. i have the kids hunting for it. and it is finally discovered by a11. and the reason i had such difficulty finding it is because i wasn’t looking for that. i was looking for this. i just assumed it only came packaged like this – my horizon’s have been broadened. so this morning the stars were aligned correctly and i made the miccc-e.
the first step after the first step of purchasing the correct supplies is to dress properly. and then assemble the wet ingredients and the dry ingredients. put all the wet ingredients together into a big bowl, like this one. it is the biggest not-really-a-mixing-bowl-but-will-have-to-suffice bowl i have. at this point i realized i might want to actually get the mixer out of it’s box – so i could actually use it. and then i spent a little bit trying to figure out if this warning applied to me. while my metal capabilities might be questionable i forged on. in the large bowl – cream together 3/4 c. butter flavored crisco, 1 1/4 c. firmly packed brown sugar, 2 tbsp milk and 1 tbsp vanilla. blend until creamy. then blend in one egg. in another bowl, mix together 1 3/4 c. all-purpose flour, 1 ts. salt, 3/4 tsp. baking soda. add the dry ingredients to the creamed mixture – gradually. and realize that the bowl the dry ingredients were in is plenty big enough for the cookie dough so transfer from kfc bucket to much more attractive bowl. next comes the chocolate chips. stir in 1 1/2 c. semi-sweet chocolate chips. bake for 8-10 minutes for chewy cookies or 11-13 minutes for crispy cookies. if you’re using a convection oven do not take your eyes off of them, because it cooks fast. really, really fast. i was prepared for that and had no cookie fatalities. when they’re however you like them take them out of the oven and cool. and, yes, my kitchen facilities do only allow me to bake 1/2 dozen cookies at a time. michael’s worried that there won’t be any of these left when he returns on thursday. that concern might be justified. 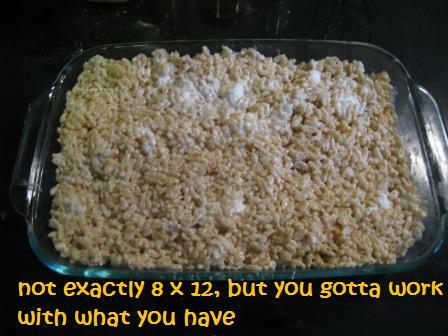 can we find rice krispies, too? i finished the ball band and because i want to share the illness that my perfectionism can be i’m posting a pic. the mistake is glaring. i wanted to rip it all out and start over. it pains me to look at it. what do you mean you don’t see the mistake. it’s right here. see, it’s awful. what? you still don’t see it? it’s so bad i’m not certain i can let it be used to do the dishes. but these, these are good. not ball bands, but certainly dish worthy.